Work until last week, for the most part, used Dr. Frank A. 's 1907 book. Why? It was available on-line at several places. Last week, we found out that the 1933 book is available, too (post on Heather's brick wall - Benjamin Gardner). It was so good to see this book so that we can continue apace. By this time, Dr. Frank A. had gathered a little more information (26 years of work). He mentions the ship on which the family came. And, the Zouch Phoenix is on the list of ships at the Weymouth, UK site. Notice that the UK site says that the family of Martock, Somerset. Earlier, we saw a Thomas and Margaret married in Sherborne, Dorset. These two places are only about 14 miles apart. 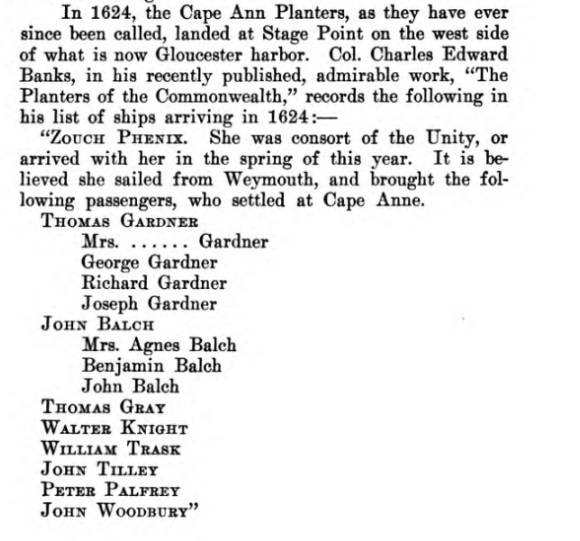 Thomas Gardner and his wife, George Gardner, Richard Gardner, Joseph Gardner (all either of Weymouth or of Martock, Somerset), John Balch of Horton, Somerset, Mrs Agnes Balch, Benjamin Balch, John Balch, Thomas Gray, Walter Knight, William Trask of East Coker, Somerset, John Tilley, Peter Palfrey of Horton, Somerset, John Woodbury of Dorchester, Dorset. 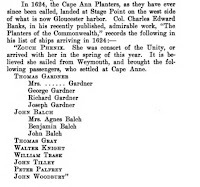 Supposedly, there were some people were left at Cape Ann in the fall of 1623 to over winter. This needs a little more attention. 03/03/2015 -- We have more questions than answers (actually, the preferred state as it motivates more study). Looking at the passenger list, we see Joseph. Dr. Frank has him being born after Samuel. Where is son Thomas who was firstborn (do we have a transcription problem here?)? 03/14/2019 -- Added image for the index on our portal to truth.